Weighing less than six ounces, the American kestrel (Falco sparverius) is one of the world’s smallest falcons and also one of the most colorful. 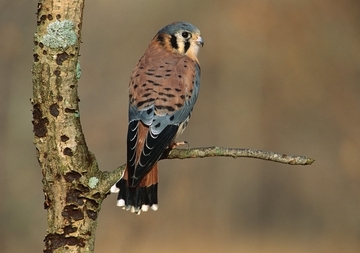 The male sports rich, blue-gray plumage on its head and wings, and both sexes have a rust-colored back and a distinctive black stripe under each eye. Small though they may be, these raptors are efficient predators that swoop down upon small birds and rodents. They also eat insects and occasionally small reptiles. Year-round populations can be found from the Canadian border to the tip of South America, while summer breeding territory extends north into Canada and Alaska.